When you plan a tour to Fort Worth, our team will make sure you experience true, Texas hospitality with our complimentary Happy Trails Greeting. 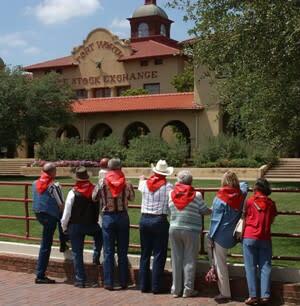 The Happy Trials Greeting Program is intended for leisure groups traveling to North Texas that include an overnight stay in a Fort Worth Hotel and includes an in-person welcome at one of our two visitor information centers and complimentary welcome gift for each member of the group (ie: Fort Worth bandanas). Please contact us for more information if your group is visiting Fort Worth without an overnight stay.